How we met: Through a mutual friend who was my roommate at the time. He already knew both of us quite well and he thought we would make a great couple, so with his help and Facebook we arranged a date down in Coolangatta, and the rest is history as they say! Proposal: Woke up early on a Saturday morning and took Sandhya up to Brisbane for a small chartered helicopter flight around Brisbane City which was amazing as you could see all the way to the mountains. Sandhya was so wrapped and once we landed I helped her off the helicopter and proposed to her, and she obviously said Yes! 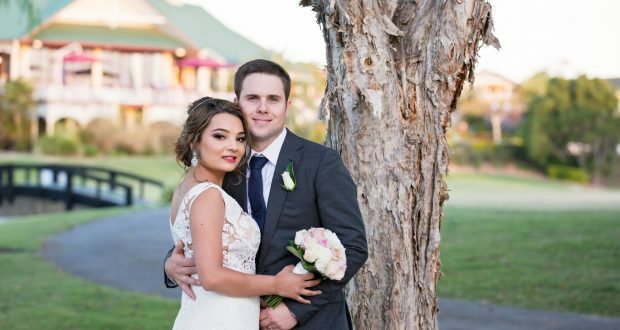 Ceremony Venue: The beautiful Palmer Colonial Golf Club down in the garden in front of the water, Celebrant was Helen Coghlan who was very patient, supportive and really made both Sandhya and I feel very comfortable and in control of the ceremony. We used traditional vows, and had my young cousin girls do readings which was really nice. 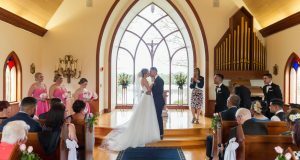 Music: Sandhya and I picked the ceremony music together and went with songs that we thought fit our relationship and meant something to both of us. ‘All of me’ by John Legend for walking down the aisle. ‘Just the way you are” Bruno Mars for signing the wedding certificates and “You and me” Life House as our Introduction as Mr and Mrs Miller. Reception Venue: Palmer Colonial Function Venue was perfect as only a short walk away from where the ceremony took place. Flowers: The tables had light blue and purple spiralling flowers inside tall clear glasses, Sandhya’s bouquet was an array of lightly coloured flowers in pink, violet and peach. Sandhya went to great effort to source the flowers she wanted on each table and the dinner area was a luxurious white and sparkling theme. Cake: A marvellous triple decker cake made by Deliciously Decadent Cakes. Top tier was raspberry swirl, middle tier – hazelnut chocolate blended with creamy choc mud and bottom tier – choc mint, The white and navy blue design of the cake really complemented the setting of the whole wedding and many of the guests commented on how delicious it was. Favours: We gave the guests at their dinner table, a high quality golf ball printed with “James and Sandhya Wedding” as we thought it would be a nice touch for people to remember our wedding. 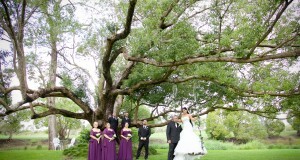 Photography: Bec Pattinson covered our wedding day from 10 am until 9 pm. She took photos of the girls getting ready, the boys at the venue before the wedding ceremony and after the ceremony the bridal party and Bec jumped in golf carts and went out and took many amazing photos on the golf course which was amazing as we have had some of these photos printed out and put into large photo frames and canvas – Bec captured the whole wedding which is really nice to look at and remember the day. Honeymoon: We went to Queenstown and relaxed in a country style lodge with marvellous mountain views. As we live on the Gold Coast we found this was a nice change in climate and scenery and we both found it very romantic and a great place to relax, stay warm and enjoy each other’s company. Advice: Just follow what is in both of your hearts for your wedding, as the main thing is that it reflects who you are as a couple and it should be a beautiful stress free day where you both still feel like you are special and spoilt.